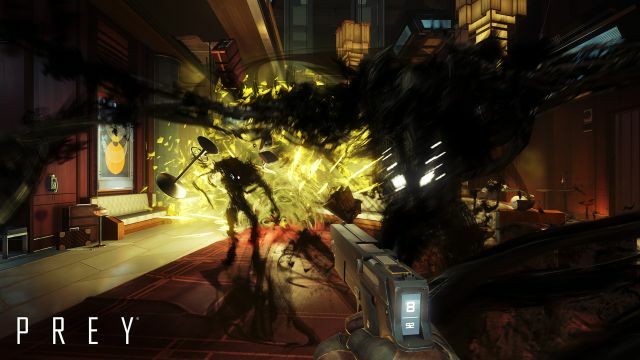 Last night at The Game Awards, Bethesda Softworks and Arkane Studios released a new trailer for their upcoming title Prey, and now they’ve debuted an extended look at the game featuring over eight minutes of gameplay footage. Check out the Prey gameplay footage below! RELATED: The Game Awards 2016 Trailers and Winners Revealed! Nothing is as it seems aboard Talos I. Orbiting the Moon, the Talos I space station symbolizes the height of private space enterprise. Explore a lavish craft designed to reflect corporate luxury of the 1960s, and navigate interconnected, non-linear pathways built to hide countless secrets. As Morgan Yu, players set out to unravel the clues you’ve left behind for yourself, and discover the truth about your past. What role will you play in TranStar’s plans, and the mysterious threat ravaging the station? The shadowy extraterrestrial presence infesting Talos I is a living ecology bent on annihilating its prey. It’s up to you, one of the last remaining survivors aboard the station, to end the deadly attack of these haunting predators. Gain alien abilities to develop a distinct combination of powers and upgrade your unique skills. Craft increasingly useful items with the blueprints, gadgets and tools on board the station to overcome dangerous obstacles in your way. Survive unprecedented threats with your wits and ability to improvise. Prey will be released for PlayStation 4, Xbox One, and PC in 2017.